Natives, whose leaves are with us, are destined to come to us at the appropriate age specified on the leaves from any part of the world. Mr. Durai Subburathinam of Kausika Agasthiya Nadi Jothida Nilayam in Tambaram, Chennai. Mr. Durai Subburathinams Nadi centre commands the faith and respect of thousands of people who have tested the authenticity of the leaves he holds. Mr. Subburathinam, in this eye-opening article, offers some pointers by which the common public can distinguish between genuine Nadi Readers and hoaxes. Q : Sir, you seem to possess a good collection of old palm-leaves. Could you tell us the history of these palm-leaves? in Tamil means (destined) to come on own accord. Q : Do you mean to say that you dont possess the leaves of those who are not destined to come to you. A : Exactly. They may not even know that such a type of astrology exists. Even the very age when the native is destined to come to us is marked on the leaves. So, we do not advertise for our profession. Whoever is destined to come will come. Faith is the root of our system. Q : What is the first step in Nadi Astrology? A : We take the impression of the right thumb for males and the left thumb for females. There is no need to disclose your name, place or horoscope. Q : How do you proceed further with the thumb impression? A : Lines on the thumb are classified into 1008 types. Palm leaves are arranged according to these types. We identify the particular type of lines on the thumb and the corresponding set of palm leaves are taken. For example, a particular type is called conch shell with a circle. Among this, there are many sub-divisions based on the number of dots on the thumb. Impressions with 5 or more dots are very rare. Q : What is the significance of Nadi Astrology? where any query is answered. All these were written hundreds of years ago by our Maharishis. Q : Amazing. But how is it possible?  Vasishta, Agasthya, Kaushika, Sukar and others. Sage Agasthya has written in Tamil. Other Sanskrit texts were translated into Tamil. Marata King Sarabhoji and Chola kings patronised this form of astrology and translations. Q : Could you share some of your experiences with us?
. What is written on the leaves is read and explained by us. We ourselves donot add anything. Some clients get irritated when some of the facts are unpleasant. We cannot help it. With utmost patience, we clear their doubts. Common people and VIPs from all walks of life have consulted us. We show them the particular leaf where the predictions for the native is given. Some of our customers are able to read the leaves on their own. Some even buy their leaves for preservation. Q : Could you pick the leaf for one of us who have come from EST? Q : There is a general complaint that the Nadi readers collect a lot of informations from the client himself? What is your answer to this? and nothing more. 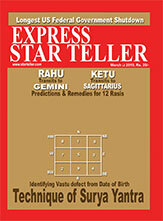 You can also verify your horoscope with the description of the horoscope given in the leaf. Without truth and integrity, we cannot survive for so many years and generations. Of course, there are places where there are fake leaves. They will not be able to show you the leaf with your name and other details. Q : Also there is a opinion that the remedial measures are suggested only by you and that they are money-making gimmicks? A : No. This is not true at all. We only read the remedial measures given in the particular chapter. Generally remedial measures are like visiting particular temples, feeding the poor etc. There is no compulsion to do them. Corresponding to the sins, the remedial measures are suggested in the leaves. The clients can themselves verify them in their leaves. In some cases, while reading the 13th chapter, there is a suggestion of giving alms to the Nadi reader for preserving the leaves. He helps the native to amend his sins by Informing the native of his poorva-karma. But these are only optional. Q : Do these remedial measures really reduce the troubles? A : Yes. I have seen many people getting benefitted by this. We get the feed-back from the clients. Pleased with our service, they bring their friends and other relatives for Nadi-reading. Q : People say that they have to wait for hours to get the Nadi reading. How far is it true? A : The time duration depends upon the identification of the thumb impression. Some impressions are identified easily and the corresponding leaves are found soon. Q : I have seen many foreigners waiting outside to see you. 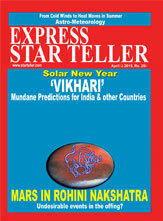 How far do they believe this Nadi-astrology? A : I have clients from U.S.A., Canada, Japan, Hong Kong, Singapore, Sri Lanka, Malaysia and other places. They have complete faith in Nadi-reading. Some even fast their thumb impressions and get the predictions. We have translators with us to serve them. Q : Will your children take up the same profession? A : Yes. Our children are also interested in this profession and they are learning the old script and other languages. With the blessings of our ancestors, we will continue for generations. Q : Thumb impressions are unique scientifically and are used for legal purposes. What is the difference between your classification and theirs? A : For legal purposes, the whole thumb is studied minutely. But we concentrate only on the centre part of the thumb and the sub-divisions therein. This is a humble attempt to clear some of the doubts and mysteries surrounding Nadi Astrology and to bring out the authenticity of the ancient art.